“Defense Correspondent Iqbal Athas is preparing to temporarily leave Sri Lanka with his family following a barrage of threats and intimidation apparently orchestrated by the Government of Sri Lanka (GSL). On August 12, he wrote an article for the Sunday Times about the Ukrainian Government’s inquiry into ‘irregularities’ in the sale of four MIG-27 aircraft to Sri Lanka. On August 14, a Sinhala version of the article was published in a local paper. 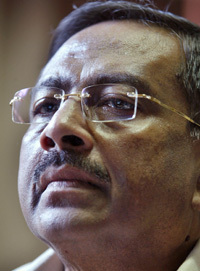 The next day, the government withdrew Athas’s security detail. Since then, demonstrators have gathered to protest in front of his house, a man claiming to be a retired Air Force officer threatened to kill his translator, and he has received warnings that he may be kidnapped and questioned about his sources. Athas’s situation has received extensive coverage in both local and international media. One of Athas’s employers, CNN, and the Committee to Protect Journalists (CPJ) have championed his case. Ambassador Blake telephoned the Defense Secretary Gotabaya Rajapaksa on August 24 and told him that it would be bad for Sri Lanka if anything were to happen to Athas. Embassy believes the widespread publicity this case has received, and its own efforts, will give some measure of protection to Athas and his family. Post will continue to keep in close touch with Athas and intervene further if required.” the US Embassy Colombo informed Washington. The Colombo Telegraph found the related leaked cable from theWikiLeaks database dated August 30, 2007. The cable is classified as “CONFIDENTIAL” and written by the US Ambassador to Colombo Robert O. Blake. Ambassador Blake telephoned Defence Secretary Gotabaya Rajapaksa on August 24 and told him the U.S. was concerned about Athas’s safety and that it would be bad for Sri Lanka if anything were to happen to such a prominent columnist. “Gothabaya said ‘Iqbal should not worry… there should not be any problem at all.’ He noted that other journalists had written more damning articles and survived.” Blake further wrote.